Chris James describes the development of atmospheric steam treatments vessels used by FRPERC. 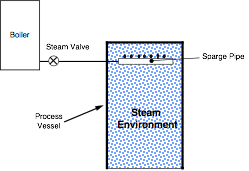 The basic principle behind the use of atmospheric steam for decontamination is to utilise a vessel with an open base, permanently filled with steam. The steam remains in the vessel because it is less dense than the surrounding air. To treat the product, it is simply raised into the steam for a set amount of time. 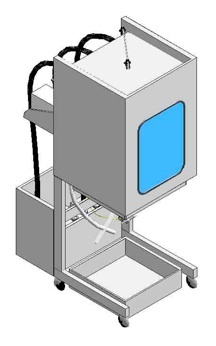 An atmospheric steam vessel has several potential benefits over a pressurised vessel in that it is simple, leading to lower capital cost and ease of maintenance; the bulk of the system is at atmospheric pressure reducing safety risks; there is no vacuum pull down either before or after the process thus reducing the time that the food product is in the vessel; and, there is no delay in opening and closing a door as there is with the pressurised system. However, there are potential disadvantages: there is no initial removal of non-condensable gases; it operates at one condensation temperature, 100°C; and, there is no integrated cooling after heat treatment. Initial studies were carried out using a very simple prototype rig produced by cutting the base off a large, food grade, plastic barrel (see below). In this prototype steam was supplied from a boiler with the steam line entering near the top of the barrel and was fed into an upward pointing sparge pipe to distribute the steam. The steam flow was controlled by opening the solenoid valve from the boiler and manually adjusting an isolation valve to achieve the desired flow rate. An initial temperature test was conducted using a mock food product with thermocouples attached to its surface. The measured temperature in the vessel was less than that expected for steam at atmospheric pressure (c.100°C). An investigation revealed that this was due to air entrapped by the turbulence of the steam coming out of the sparge pipe at a high velocity. Thus the method of steam introduction was altered to create a more stable flow. The steam inlet was moved to the top of the vessel where it exhausted into a plenum chamber. From the plenum chamber, steam entered the body of the vessel through a perforated baffle plate. This improvement produced a much more stable flow within the vessel, with excess steam gently spilling out from the base of the vessel. No air was entrapped and a much higher temperature was produced within the vessel. Tests were then carried out to determine the uniformity of steam distribution and the effect on the distribution of inserting samples. 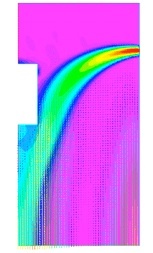 Computational fluid dynamic (CFD) modelling was carried out to see the effect of air entrainment caused by the product moving from the air into the steam (see below). Using the experience gained from the initial pilot plants and the CFD studies a more user and food friendly atmospheric pilot plant was designed and constructed (see below). The final cabinet consists of a double-skinned stainless steel treatment chamber supported by two legs. A layer of insulation lies between the two skins and a third skin surrounds the front and sides. The front of the vessel houses a double glazed unit to allow viewing of product during treatment. 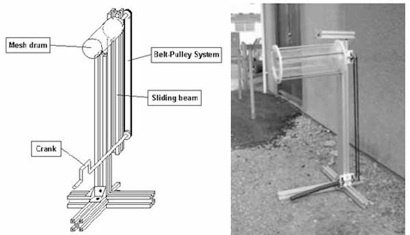 The food sample is raised into the chamber on a gambrel that is attached to a pneumatic cylinder mounted on one of the legs and connected via pulleys. This allows automated movement of the product into the chamber. A relay switch that can be adjusted to a desired treatment time controls the pneumatic cylinder. An alternative method of introducing the food to the steam environment has also been developed for small food products. This uses a tumbling mesh drum to ensure an even treatment of all food surfaces (see below). In the new system steam is provided by three 2.8 kW boilers operating in tandem. The boilers are placed in a stainless steel box supported on the back of the legs. Steam enters the plenary chamber at the top of the vessel through 7.5 cm pipes and is evenly distributed into the main chamber through a baffle. Pressurised air for the pneumatics is provided by a permanent fixed supply. The control box for the pneumatics and temperature-monitoring equipment is placed on a shelf at the back of the cabinet. Around the bottom of the chamber is a lip to collect condensate from the inner walls of the vessel and drain it into two bottles alongside the boilers. 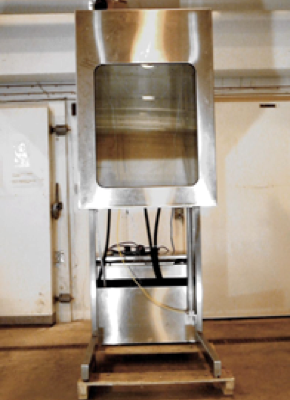 This pilot scale atmospheric steam cabinet was successfully used in many experimental trials involving poultry, pork, lamb, beef and also fish, fruits and vegetables, both in a laboratory setting and alongside commercial processing lines in industry to demonstrate the effectiveness of steam interventions in lowering microbial loads.